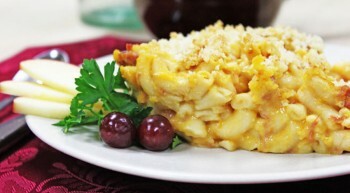 Vanee Macaroni and Cheese is made with tender elbow macaroni in a perfect blend of aged cheddar cheese. Perfect right out of the can, as a base for a signature mac & cheese, use with chili to make chili mac, or sloppy joe to make sloppy mac. 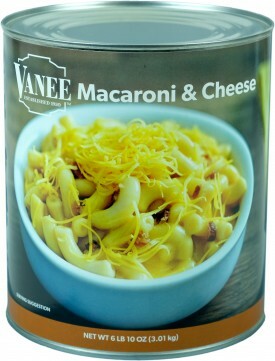 Vanee Macaroni and Cheese frees up valuable freezer space by being shelf-stable, doesn’t have to be thawed, and is heat-and-serve for ultimate back-of-house simplicity. Each 106 oz. can has 13 one-cup servings, for 78 total servings in a case. Serve 8 oz. in bowl, or use as with chili to make chili mac, or with sloppy joe to make sloppy mac. Water, Enriched Macaroni (Semolina, Egg Whites, Niacin, Ferrous Sulfate, Thiamine Mononitrate, Riboflavin, Folic Acid), Cheddar Cheese (Pasteurized Milk, Cheese Cultures, Salt, Enzymes), Soybean Oil, Cheddar Cheese [Cheddar Cheese (Milk, Cheese Cultures, Salt, Enzymes, Calcium Chloride), Water, Disodium Phosphate], Food Starch-Modified, Salt, Whole Milk Powder, Butter (Sweet Cream, Salt), Sodium Phosphates, Vinegar, Flavor (Whey Powder, Autolyzed Yeast Extract, Lactic Acid, Natural Flavor, Cultured Whey, Soy Lecithin), Locust Bean Gum and Guar Gum, Onion Powder, Blue Cheese Powder [Blue Cheese (Milk, Cheese Cultures, Salt, Enzymes, Calcium Chloride), Nonfat Dry Milk, Disodium Phosphate], Annatto Color, Natural Flavoring.